Hitachi recently announced the release of several new classroom technologies, including StarBoard Software 9.0 for Mac OS X, a new wireless tablet, and a new SXGA widescreen interactive display. Hitachi StarBoard Software 9.0 for Mac OS X is a suite of tools designed to support Hitachi's StarBoard line of interactive devices. The new Mac release providing functionality similar to that of the Windows version, but with some enhanced features, including a new live desktop mode allows, which lets users ink over animations and videos, including YouTube videos.It also allows users to customize the interface by dragging tools from the toolbar and dropping them onto pages on the screen. StarBoard Software 9.0 for Mac OS X is available for download now. The download form can be accessed here. Hitachi has also introduced two new hardware products targeted toward the classroom: the StarBoard T-19WX Interactive Display and the StarBoard WT-1 Interactive Wireless Tablet. Support for connecting up to seven of the devices to a single computer. The StarBoard T-19WX Interactive Display is a 19-inch widescreen (16:10) pen display that provides an SXGA resolution and a writing resolution of 1,000 LPI. It's designed to be used in conjunction with a larger display or projector, allowing the presenter to draw, annotate, and otherwise control the presentation while the audience views the larger display. 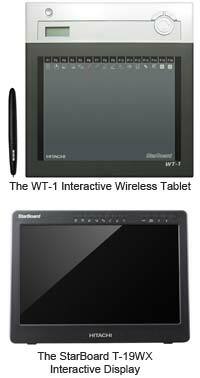 It includes several of the features of the WT-1 Interactive Wireless Tablet, including handwriting recognition and a wireless pen with two customizable buttons. It also includes eight customizable shortcuts, a tilt stand, VESA mount, and VGA output. It measures 18.2'' (H) x 13.7" (W) x 2.4" (D) and weighs about 12 pounds. Further information about the new products will be available here. In other Hitachi news, the company also announced the launch of a new forum called the "StarBoard Community Forum." It will be a resource for StarBoard users, providing tips, news, links to Web resources, technical help, and other resources for users. Further information can be found here.